Jose Capablanca was the superstar of chess in 1922 and London was his first serious chess in the 15 months since he had won the championship title from Emanuel Lasker. "Capa" was the chessplayer whom even non-players could identify. 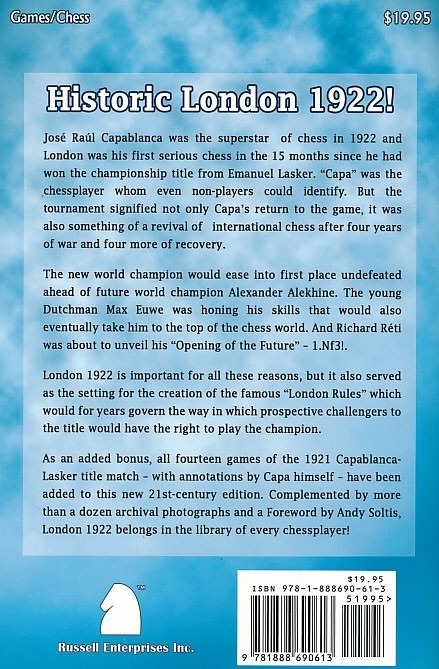 But the tournament signified not only Capa's return to the game, it was also something of a revival of international chess after four years of war and four more of recovery. The new world champion would ease into first place undefeated ahead of future world champion Alexander Alekhine. The young Dutchman Max Euwe was honing his skills that would also eventually take him to the top of the chess world. And Richard Reti was about to unveil his "Opening of the Future" - 1.Nf3! London 1922 is important for all these reasons, but it also served as the setting for the creation of the famous 'London Rules' which would for years govern the way in which prospective challengers to the title would have the right to play the champion. 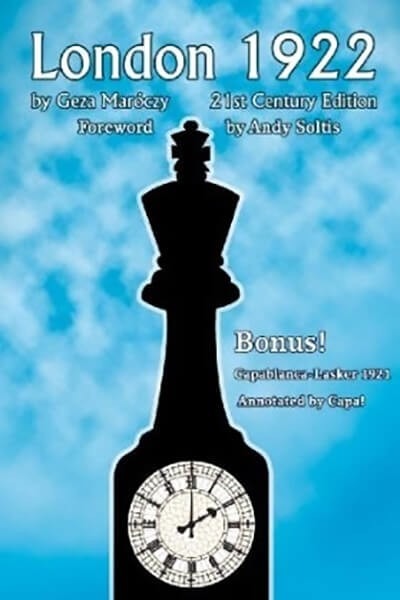 As an added bonus, all fourteen games of the 1921 Capablanca-Lasker title match - with annotations by Capa himself - have been added to this new 21st-century edition.